A still frame from FURY IN THE PACIFIC, a joint United States Armed Forces documentary on the invasions of Peleliu and Anguar in the Palau Islands. 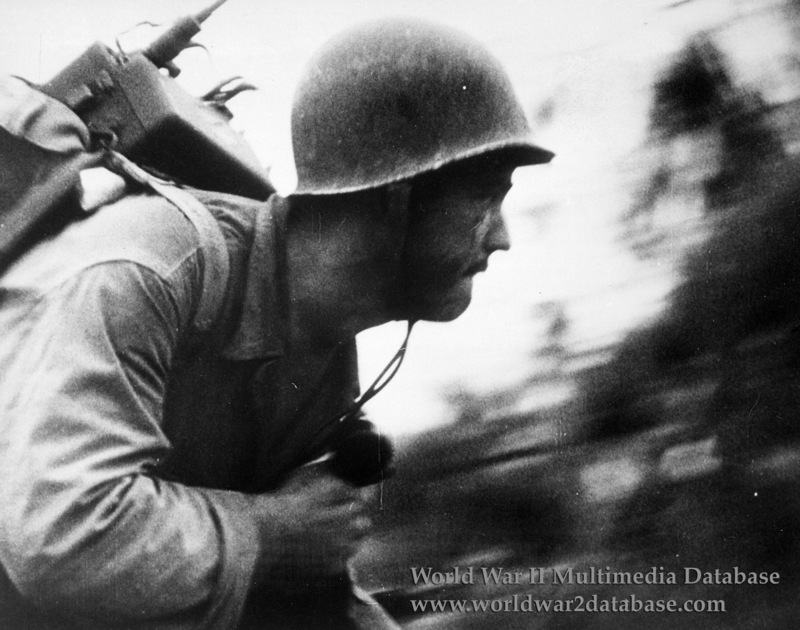 A 1st Marine Division radioman with a Motorola SCR-300 "Walkie-Talkie" backpack radio rushes forward as his fellow Marines crouch in the jungle. He carries the radio with the cover closed and the handphone in one hand and his rifle slung across his shoulder. He carries another pack on the back of the radio. The SCR-300 could weigh 38 pounds (17.2 kilograms) with the larger battery. This man is weighed down with over 75 pounds (34 kilograms) of gear. Only six reporters landed on Peleliu because the operation was supposed to last three days. One was Marine Sergeant Alvin G. Flanagan (January 1, 1915 - November 24, 1999). Flanagan and other SCR-300 operators' radio communications were recorded aboard transports offshore. On October 20, 1944, the day of the invasion of the Philippines, Flanagan's recording of the invasion of Peleliu was played over the Mutual Radio Network to the American public. Flanagan, a reporter and director for WOR Radio in New York City before the war, became a television executive and President of Gannett Broadcasting after the war. Date estimated.